Of the many new voices that emerged during the independence referendum one of the most compelling was the Mair Noch A Roch Wind blog run by three young Labour and trade union activists. The blog takes its name from the gale blowing through Hamish Henderson’s Freedom Come-All-Ye signifying the radical possibilities that open only at times of political crisis. 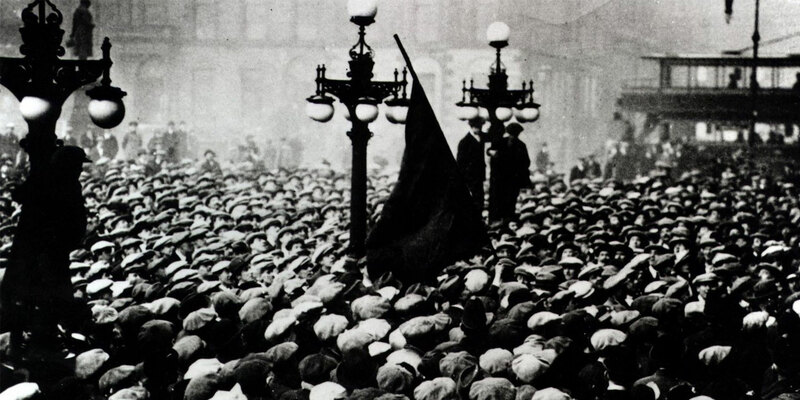 For the blog’s authors, Cailean Gallagher, Rory Scothorne and Amy Westwell, the storm that shook Scotland during 2014 carried the distant seeds of a transformation more radical even than independence: that of socialist revolution. The trio supported and even worked for the Yes campaign, but only in so far as it might serve to destablise the current political and social order, to illuminate and widen cracks and fissures that might be exploited at some future revolutionary moment. It’s unclear how many readers were convinced by the blog’s unapologetic advocacy of Marx and Machiavelli, but it shone fresh light on the referendum debate from an unexpected angle, carving out a following in a crowded field for its sharp commentary on the various complacencies to which both the mainstream Yes and No campaigns were prone, and for the consistent quality of its prose. Those gifts for razor-sharp analysis and vivid imagery are abundantly on display in a fine new collection of essays, Roch Winds: A Treacherous Guide to the State of Scotland, in which Gallagher et al examine the state of Scottish politics in the aftermath of the referendum. It isn’t necessary to share their particular brand of radicalism to appreciate the wealth of political insight here. Although none of Scotland’s established parties escape Gallagher et al’s withering gaze, much of the book is dedicated to a forensic analysis of the nebulous cluster of hopes and dreams that constitute ‘Civic Nationalism’, the ideology that increasingly sets the parameters of Scottish political discourse. In the ongoing absence of any effective opposition to the SNP’s complete dominance at Holyrood and beyond, commentary of this quality is badly needed to puncture Scotland’s self-satisfied political consensus. For Gallagher et al that smugness was epitomised by the first visit of Scotland’s new bloc of SNP MPs to Westminster following last year’s General Election, an encounter widely covered by a fawning Scottish media. Much as the Soviet leader Nikita Khruschev sneered at the vulgar commercialism of the United States during his 1959 trip to Washington, the Nationalist contingent took delight in mocking the strange ways of the evil empire by the Thames: the vestigial archaisms bearing the traces of British parliamentary democracy’s slow emergence from feudalism, the corridors thick with lobbyists, the cruelty of its ravenous media, and, above all, the aggressive politics of conflict that shake the starkly oppositional Commons chamber. How very coarse it all seemed in contrast with Holyrood’s civilised proceedings, its legislation moving at stately pace through its quiet committees, its doors open to trusted representatives of Scotland’s established civic institutions, the very design of its hemispherical parliamentary chamber facilitating respectful rational exchanges. The SNP glorifies Scottish society’s immunity from conflict, and wishes to broaden this frictionless sphere to include the currently reserved domains of the economy, foreign affairs, business and industry. When the Scottish state-keepers glare enviously at those economic and military powers wielded all too enthusiastically by the ‘Westminster elite’, they invite us to imagine themselves holding those same powers with all the care and delicacy owed to an object of distant, respectful desire. The economy and international relations, the objects of fiscal and foreign policy, are precious butterflies; if fought over and handled roughly their wings will be crushed, their antennae bent. The SNP apparatchiks arrive in Westminster as aspirant butterfly-keepers, hoping to find the gentle insects a new home in the lush greenhouse of Holyrood where they can be nurtured by a benign national caretaker class. Gallagher et al suggest this high-mindedness is an illusion generated by a failure to acknowledge the critical difference in the nature of the two institutions: Westminster is a ‘tax-and-spend’ parliament, responsible for raising the money it distributes, whereas Holyrood is ‘grant-and-spend’ assembly, responsible only for distributing funds guaranteed by Westminster’s block grant. Holyrood is protected from the elemental political forces that buffet the British Government, which carries the burden of raising the money it spends in a competitive global economy. Politics at this level is bound to be confrontational, the angry exchanges at the dispatch box reflecting the impossibility of reconciling the divergent interests of the extra-parliamentary constituencies that fight to determine how money is spent and raised. Westminster’s power to set tax rates and pull the fiscal and monetary levers that shape the environment in which business operates subject it to pressures exerted by powerful financial and corporate interests to which the Scottish Parliament is not subject. It is the SNP’s experience of running Scotland’s ‘play-pen parliament’ that has made possible the evolution of the Civic Nationalist ideology (referred to as ‘Social Nationalism’ by Gallagher et al), a doctrine confident that the divergent interests of conflicting constituencies – businesses, workers, civic institutions – can be harmonised by appeal to the unifying ideal of a shared national interest. These comforting assumptions have persuaded much of Scotland that it really is possible to practise a new kind of hygienic politics that evades the necessity of arbitration between antagonistic social forces. Gallagher et al – following a line or argument that overlaps with Gerry Hassan’s Caledonia Dreaming – trace Social Nationalism’s evolution to Scotland’s social democratic ‘golden era’ administered by the social planners of the 1950s, 60s and 70s, a public-spirited Modernist technocracy that designed Scotland’s public services and built its New Towns. Dismayed by the disintegration of the post-war settlement, the elite that had run Scotland for so long – public sector professionals, the Kirk, educationalists, moderate trade unionists, the Labour political establishment – sought its perpetuation by establishing the Civic Scotland movement that campaigned for devolution through the 1980s and 90s. Spared from the need to wrestle with the tough problems of raising money, Holyrood has been free to evolve ever more elaborate mechanisms for determining how the resources available to it are distributed, developing, for example, a finely tuned welfare economics that seeks to gauge the well-being of Scotland’s ‘assets’ – its citizens – according to a matrix of 18 ‘national indicators’. The referendum campaign created a space for unbounded dreaming about the possibilities open to an independent Scotland run in this consensual, technocratic fashion. The SNP’s White Paper promising a seamless transition to a managerial Scottish state was complemented by a cluster of initiatives eulogising the prospect of an orderly civic state, most notably the Common Weal’s influential blueprint for a progressive Scotland in which competing sectors would gladly put ‘All Of Us First‘ for the sake of the common good. Every well-meaning citizen seemed to come up with a new, limitless blueprint for Scotland, advocating the democratic equivalent of relocating Ben Nevis to the Borders. When RBS came along and said ‘Actually, we control you’, most people experienced despair or denial. Everything became pointless, or everything would be fine. Devolution is a lobster pot: the creatures of Scottish politics are trapped in the mesh of consensus, pincers snapping feebly in the face of powers far outside their reach. Gallagher et al suggest that Scottish Labour’s uninspiring defence of the Union throughout the referendum – which has cost them a Scottish working class vote that no longer has faith in the status quo – was at least sincere, rooted in the belief that Scotland’s public services can only be maintained within the context of British capitalism. The SNP have sought to claim the mantle of a purer social democracy once proudly championed by a more virtuous ‘Old Labour’, but for Gallagher et al this is just another illusion: the compromises of the New Labour era were the most recent manifestation of Labour’s continual battle to broker some form of social democratic state in the teeth of the private sector’s hostility. During the post-war golden era ‘Old Labour’ might indeed have had it easier: reliable economic growth generated the tax revenues necessary to fund public services, and strong unions were able to force decent wages. But it soon morphed into a messy business of incomes policies, ‘beer and sandwiches at No 10’ and currency devalutions: social democracy is always necessarily compromised, a fractious struggle to broker a truce between capital and labour. And it has only got harder in more recent decades, the globalisation and financialisation of the world economy limiting the capacity of nation states to draw tax revenues from business, and weakened labour movements forcing governments such as those of Blair and Brown to supplement low wages with tax breaks, minimum wage legislation and easy credit. The 2008 crash pitched social democracy into full-blown crisis, forcing states to borrow heavily to prevent wholesale collapse of the banks, and to run up debts that must be repaid on terms dictated by finance capital, including tight controls on public spending and the maintenance of cheap, flexible labour markets. Labour’s inability to respond to austerity was due to the fact that under its social democratic principles it could [not] challenge it, since it was not prepared to operate outside conditions which were profitable for capital. A Scottish state governed by the SNP would have to face up to the same challenges that social democratic parties everywhere, not just Labour, are struggling to see beyond. So, if Social Nationalism is fated – were independence achieved – to collapse into the kind of compromised social democracy that so many Scots have turned against, is there any other way forward for the Scottish left? What, exactly, is to be done (as Lenin asked)? Of the answers to that classic question that the literature of the left has sought to provide Gallagher et al stick to their revolutionary principles by favouring Lenin’s: radicals should retain a sense of disciplined vigilance in searching and preparing for whatever opportunities arise to destabilise existing political and economic structures. The book’s closing chapter, discussing how the would-be revolutionary might prepare for such a transformation, is ostensibly the most radical of all, and yet in comparison with the bracing freshness of the analysis preceding it, has a curiously stale quality. To avoid assimilation into the constructive consensus, pessimists should not yield to the demand for programmatic addendums to their critical thought … transformation of the condemned world is the job of those excluded from power, not those who already hold it. Radical experience must be related to the everyday, to what is ordinary, and that means to Glasgow’s ever expanding retail arena, the Buchanan Galleries; Cumbernauld’s library at the top of a shopping centre; flat roofed ASDAs and Tescos; towns with a Bank, a Kirk and a War Memorial; New Towns with short strips of brown scraggly land in between; asbestos office blocks. It all sounds, dare one say it of a cold-eyed bunch such as Roch Winds, rather romantic and sentimental, falling into the cliché that so much of the book so cleverly avoids. Perhaps there will be a revolution, even here in Scotland, one day. And perhaps a compelling, tangible design for a post-capitalist society might emerge that will encourage people to struggle for it in the numbers necessary to force through such thoroughgoing change. In the meantime action can surely be taken now to move towards a better society, through the conventional political mechanisms Gallagher et al seem to reject, as well as by means of the self-organisation of ordinary people. I say ‘seem’ because the degree to which the authors might be willing to use the processes of parliamentary democracy to pursue radical ends isn’t clear from this book. Nor do they do offer any account here of what a socialist society might look like. I appreciate that doing that, of course, would require a considerably longer book, and would break with Marx’s own example. But one hopes that Gallagher et al are not another set of radicals content to stay in the Marxist comfort zone of critique rather than proposition, of commenting from the sidelines rather than setting out new ways of ordering our economic, political and social life that can be subected to scrutiny. Marxist literature is already overrun with commentary on what’s wrong: much the most interesting work by radicals sets forth alternatives capable of inspiring action. Reality, perhaps, is untidier than even Gallager et al want to acknowledge: it’s easier to contribute another beautifully written work of analysis to the shelves of the radical book store than to engage in the compromised business of making use of the tools existing political processes offer, however flawed, to help improve the lives of ordinary people. It is better to emit a scream in the shape of a theory than to be entirely insensible to the jars and incongruities of life and take everything as it comes in a forlorn stupidity. Some people swallow the universe like a pill; they travel on through the world, like smiling images pushed from behind. It seems that the talented authors of Roch Winds are unlikely to take that medicine any time soon, and for the sake of Scottish political commentary may they never do so. Roch Winds: A Treacherous Guide to the State of Scotland is published by Luath Press. Well the point about a more heated parliamentary atmosphere being intrinsic to heightened conflicts of interest is certainly true. That said from my experience of observing the forms and debates in Germany regional parliaments as well as the Bundestag, and other European legislatures, it seems to me that the criticism of Westminster as being an antiquated, inefficient and immature parliament still stands. It is probably intrinsic to the overall majority, ‘strong government’ structure of Westminster. When in power a government has no real incentive to compromise, and every incentive to maximise it’s tribal benefits. The other tribe can then, in its frustration, do little more than ineffectively lambast the government, and play to the gallery. The coalitions which are the usual form of government in Europe require compromise, both at the start of a legislative term during the negotiations, and then on an every day basis. In addition the federal forms of the large countries (especially) Germany, Spain, Italy and even increasingly centralised France also force a culture of compromise and dialog. In that context the Scottish parliament is indeed more typical of the usual ‘grown up’ form of politics in at least western Europe.